One of The Shadows’ most admired serenely-paced pieces revived for the Final Tour of 2004/2005, a fine example of the masterly interplay between Hank Marvin and Bruce Welch, notable in addition for the wonderfully ringing, full-bodied tone from the famous Fender. In The Ventures’ hands the overall effect, as so often with such material, is busier, more forceful, more insistent (compare their ‘Blue Star’  for example): the lead lines have more of a kick to them, not to mention the odd ping, features also in evidence on the 2LP set Live In Japan ’77. 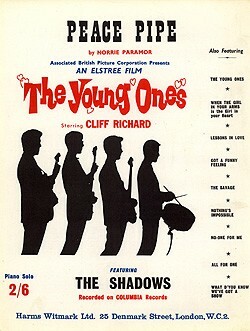 While there are resonances of the 60s in the basic guitar + drums sound, the overall production with strings and chorale, absent in The Shadows’ version (The Norrie Paramor Strings had yet to make themselves felt on group recordings) has a 70s feel to it, and indeed Don Wilson has stated that he remixed the 60s track (recorded along with The Savage??) to accompany ‘Walk Don’t Run ’77’ for release as a Japanese single. 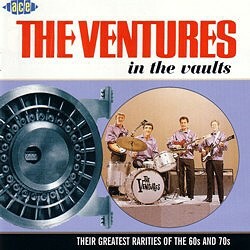 A version by The Marksmen, Ventures-like in approach, has been made generally available as a bonus track on Magic Records’ 2005 CD The Fabulous Ventures.